It’s time for this month’s pastry masterclass and it’s all about Choux Pastry! Having never made it before myself, I was looking forward to the challenge, and it was a lot more straight forward than I expected it to be, so I’m here to give you my tips and tricks for making sure you nail it first time! 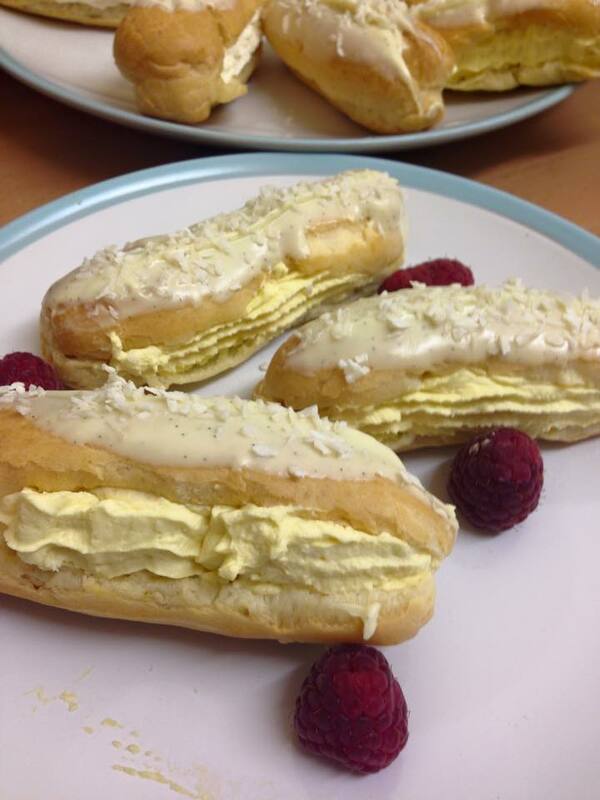 Once the pastry was made, I decided to veer away slightly from the traditional fillings and try to bring summer into my kitchen, by filling the eclairs with a mango cream and topping them with white chocolate and coconut. The mango puree I used an Alphonso Mango Coulis from Tesco I bought months ago that I didn’t know what to do with. It sweetens the cream and flavours it at the same time so you don’t need to add lots of sugar to the filling. Obviously you can just fill them with normal sweetened cream and top with chocolate if you don’t fancy my fruity filling! The key to the choux is ensuring the mixture is cooled a little before adding in the eggs so that they don’t scramble. It’s also important to poke a hole in the side of the buns after the first 25 minutes so that they don’t collapse. Go on, have a go! Put the butter, water and salt in a saucepan and heat gently until the butter melts. Once it is melted, turn up the heat and bring to the boil. Once bubbling, remove from the heat and add the flour. Beat vigorously with a wooden spoon until the mixture forms a dough and leaves the sides of the pan clean. Return to a low heat and cook for a further minute. Remove from the heat and allow to cool to hand temperature for a few minutes. Gradually add the eggs, a little at a time, beating well between each addition, until the dough is smooth and glossy – you might not need it all. Line a large, flat baking sheet with baking parchment, then pipe or soon about 12 lines of the dough over the sheet, leaving enough space between them to expand and rise during cooking. If there are any points sticking up on the eclairs, gently press them down with a wet finger so they don’t burn. Bake in the oven for 20-25 minutes until risen and golden brown. Remove the tray from the oven, and quickly poke a hole in the side of each eclair to let the steam out, then return to the oven for another 5 minutes. Once cooked, leave to cool completely on a wire rack. To make the filling, whip the cream until just stiff, but don’t overbeat! Sift the icing sugar onto the cream and fold through, followed by the mango puree. Spoon the filling into a piping bag, cut along one side of the eclair, and pipe in the cream. Melt the chocolate over a pan of simmering water in a heatproof bowl. Once melted, leave to cool for a minute until slightly thickened, then dip the profiteroles into the chocolate, and top with desiccated coconut. There you have it – 10 easy steps to creating home made eclairs on your first go! Stay tuned for next month’s masterclass on classic shortcrust pastry! I am truly impressed at your lovely chop pastry abilities. I really like the step by steps as well. Perhaps I shall add this to my list of things to try soon.